Welcome back. As some might say about art, I don’t know much about robotic actuators, but I know what I like. And I really like how Cornell University researchers are using popcorn--popcorn!--to power robotic devices. Actuators are key components of machines, not only robotic systems. When an actuator receives a control signal, it converts the signal’s energy into mechanical motion, generally linear or rotary. Actuators may be based on hydraulic, pneumatic, electric, thermal or mechanical means, and they’re increasingly being driven by software. Now add popcorn to the list. Warren’s demonstration of popcorn’s change in volume after popping: Same number of kernels, and some didn’t pop. Why popcorn? Heating popcorn kernels to vaporize the moisture produces a rapid force, motion, change in shape and rigidity, and increase in volume. These responses can be used to advantage even if they occur only once. That popcorn is readily available, cheap, light weight, biodegradable and, of course, edible are added benefits. The researchers first measured key properties of three types of popcorn subjected to four types of heating (submersion in hot oil, hot air, microwave and direct contact with heated nichrome 60 wire, which is widely used in heating elements). They found kernels pop with a relatively high force (nearly 40 millinewtons or about 0.01 pound-force). The popped kernels expand some 10 times in volume, change viscosity by nearly an order of magnitude, exhibit inter-kernel jamming and become more biodegradable. Popping can be induced effectively by the four heating methods tested, and each has trade-offs. 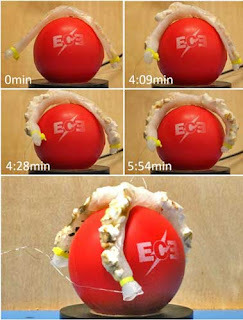 They then examined how popcorn’s unique qualities can power robotic devices that grip, expand or change rigidity by constructing and demonstrating different types of popcorn-driven actuators. Jamming actuator--they used heated nichrome wire to pop kernels in a flexible silicone rod, causing the rod to stiffen and lift a 100 gram (3.5 ounce) weight. Popcorn-driven jamming actuator. A silicon tube contains three lower modulus silicone tubes of kernels and nichrome wire. When current is applied to the wire, the kernels pop, jam against one another and create a relatively rigid rod (from stevenceron.weebly.com/uploads/9/6/4/9/96490288/popcorn-driven-robotic.pdf). Elastomer actuator-- they used heated nichrome wire to pop kernels in three silicon fingers of a soft gripper, causing the fingers to curl and grip a ball. Popcorn-driven elastomer actuator. Three silicon tubes of kernels and nichrome wire, with an attached strain-limiting layer to create bending, respond when current is applied and kernels pop (from stevenceron.weebly.com/uploads/9/6/4/9/96490288/popcorn-driven-robotic.pdf). 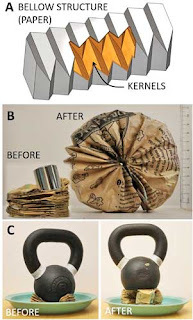 Origami actuator (shape-programmable)--they folded recycled popcorn bags into bellows, filled them with kernels and microwaved them. 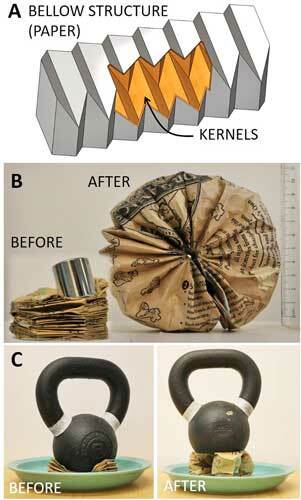 The popped kernels’ expansion was strong enough to support a 9-pound (4 kg) kettlebell. 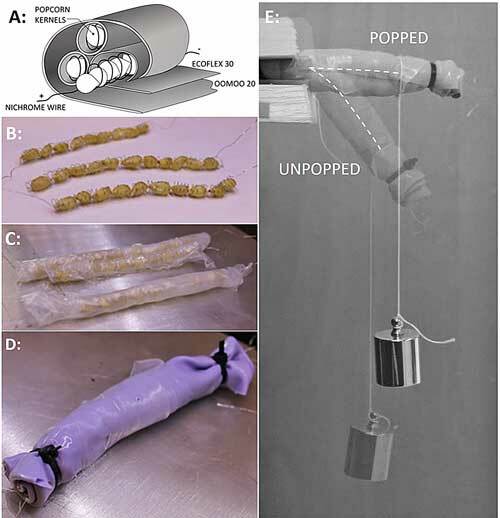 Popcorn-driven origami actuator. Paper-folded bellows filled with kernels are mechanically programmed to expand into a circle when the kernels are heated by a microwave oven and pop (from stevenceron.weebly.com/uploads/9/6/4/9/96490288/popcorn-driven-robotic.pdf). They also demonstrated the use of popcorn to actuate a three-fingered rigid link gripper. Hot-air popped kernels packaged between two wooden plates separated the plates causing tendons to contract and close the fingers. This first study of using popcorn to drive an actuator was part of a larger plan to produce simple robots that might be deployed in large numbers to perform useful tasks. Having successfully demonstrated that popcorn can power robotic devices to perform basic functions, the researchers’ next step is to design the infrastructure for standalone popcorn-driven robots. That will require an embedded system capable of heating the kernels and a pump capable of moving the kernels. Overall, the researchers hope the findings of this initial effort will help pave the way for a wide range of applications of rigid, compliant and soft robots.